ISL Engineering College, Hyderabad has advertised for recruitment of Professor / Associate Professor / Assistant Professor / Principal jobs vacancies. Interested and eligible job aspirants are requested to apply as soon as possible from 06th December 2018. Check out further more details below. 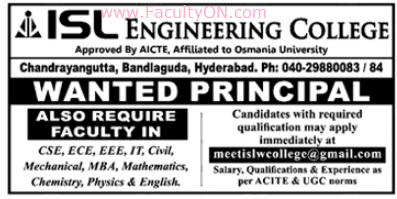 About College : ISL Engineering College is Affiliated to Osmania University,and is approved by the AICTE Estd: 2008, it is a Private Engineering College formerly known as Islamia College of Engg. & Tech. for Women located in Hyderabad, Telangana State founded by Islamia group. The college is run and maintained by the ISLAMIA group society.The college offers Bachelor of engineering (B.E) in six courses , namely, Civil Engineering, Computer Science and Engineering, Electronics and Communication Engineering, Electrical and Electronics Engineering, Information Technology & Mechanical Engineering.